Many Aussies appreciate the tremendous hardships our early pioneers endured, from the ocean to the desert and high plains. 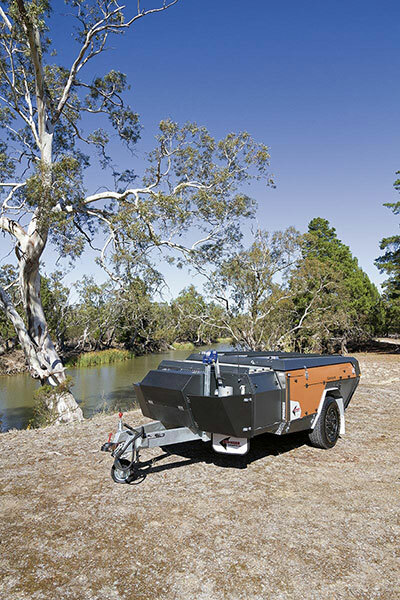 And Victorian camper trailer manufacturer Pioneer Campers shows its respect with its premium Australian-made campers to honour our explorers and to entice our intrepid modern nomads. The Pioneer Gascoyne is a tough travel mate which will follow you anywhere, with an outward appeal that turns heads. Proud lines exhibit real design flair, enhanced by a great colour combination. It’s a very well-constructed, premium quality unit with no shortcuts taken in the manufacture, and it’s fitted with premium components and accessories. For a product to be appealing it must be simple to use – I don’t tolerate fiddly jobs well, so setup must be fast and easy. 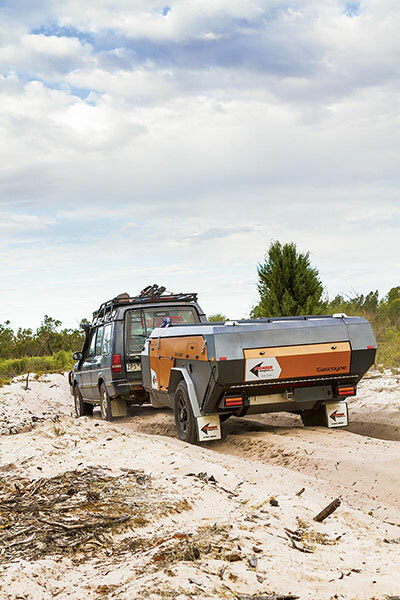 The Gascoyne couldn’t be easier to erect, and you can still access the kitchen, pantry and main storage area on the side of the track without having to open her all up. Pioneer uses a good mixture of materials and techniques in the box construction. Most panels are folded and powder-coated 1.2mm Zincanneal in a wide choice of colours, including the earthy Dulux Precious Copper that contrasts against the black base and alloy checkerplate inserts demonstrated here. The attractive, almost rusty-ochre hue is reminiscent of desert sands and river red gums. 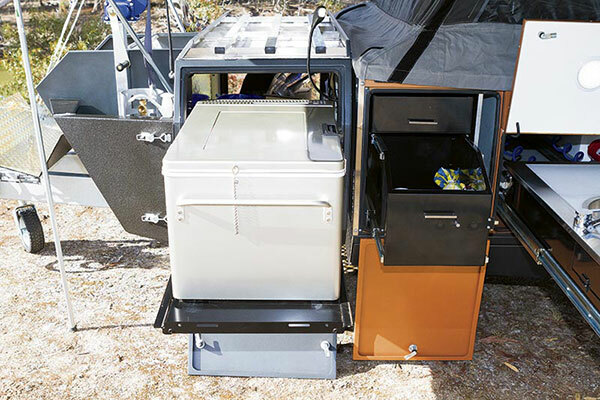 Out front, abutting the stoneguard, is a handy storage unit with an open mesh bottom and an aluminium checkerplate door that is designed for holding firewood and three jerry cans, but could easily be used for recovery gear, muddy boots or wet clothes. Two 9kg gas cylinders are shielded in enclosures either side, coated in Rhino Linings Duraspray, with a manual water pump on the passenger side. One cylinder is for cooking while the other is for the Truma hot water service. Inside, the Gascoyne is neat, comfy and cosy. It’s an easy climb, with no sharp edges, up the two well-defined steps to get to the bed. The slatted support frame pivzots easily to reveal the massive storage box under the bed and there are further drop-in storage compartments bordering the bed, including one at the front to keep your head away from the canvas while sleeping. 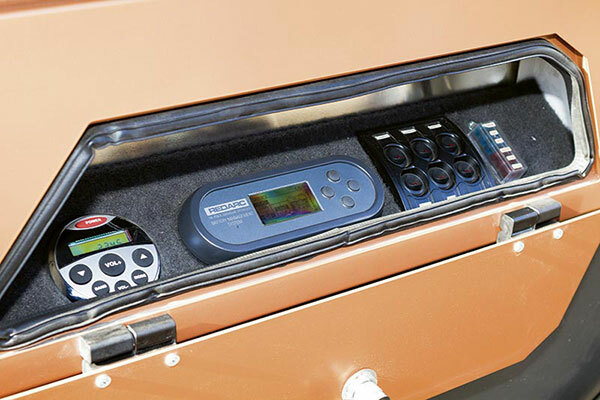 There is an internal step light, twin reading lights, 12V USB and 240V plug, two speakers, a water level indicator and the 1000W pure sine wave inverter and batteries are all neatly mounted out of harm’s way. We had the standard 2.4m full-length external awning for the demo unit but I would personally go with the optional 2m one as it can be transported without detachment, making life much simpler. Spreader poles will only be required on either of the annexe sizes in more trying conditions. It comes complete with the security of a five-year chassis, suspension and canvas warranty and is backed by a full dealer and service network around the country. The setup simply couldn’t be easier! 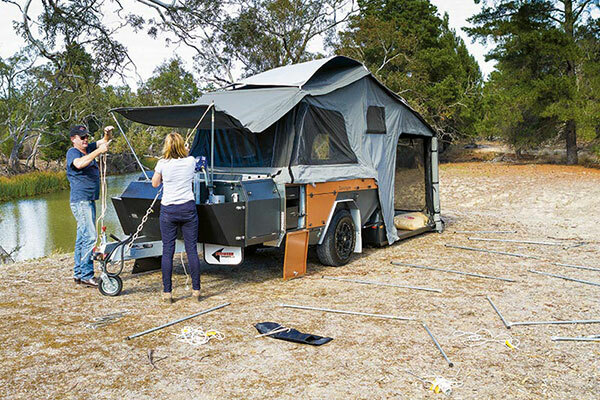 Unleash the side clamps and the gas struts help you fold out the tent quickly and easily. 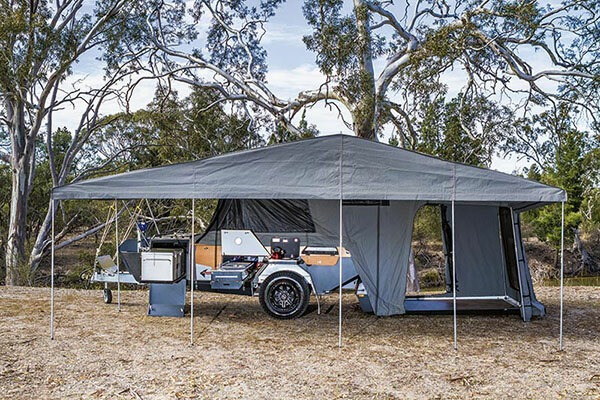 You can literally be camping in a matter of minutes. If you are on undulating ground, there are adjustable floor legs, but the unit needs little other support. The pole and canvas quality are excellent with 15oz Dynaproof on the roof and 11oz to the sides. 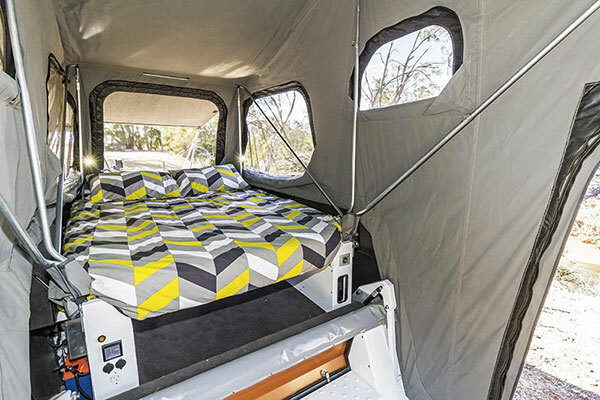 A solar-reflective insulated blanket opens with the tent. It reflects radiant heat in the sunshine and insulates in the cold. There are heaps of windows, all with mesh screens and awnings, as well as three complete doorways. The roof section extends all the way over the front compartments making a handy sheltered area for storing bits and pieces overnight. The parquetry-look vinyl floor is a roomy 1.7x2.5m and is large enough for a set of portable bunks if you’re travelling with a family. 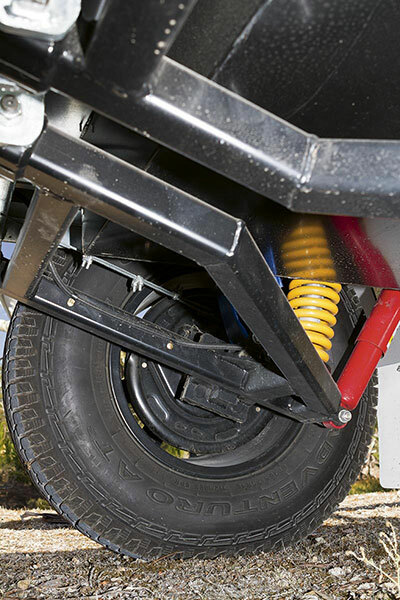 Immediately behind the drawbar and the forward compartments is a huge 650mm-wide storage area that runs the width of the trailer with fully dust-sealed doors either side. Take one step back, still in front of the wheel arch, and in the front of the main tub body we find a full-width cavity with dual access doors. There’s pole storage and a handy two drawer pantry to the kerb side. Now to the working side of the camper. Up front, there are the compartments with a fridge slide and two-drawer pantry as standard. Next, there’s the unique pull-out stainless steel kitchen. It’s best described as a small sink on top of a full-length sink/storage space with a hot/cold mixer and detachable cutting boards either side. I loved the big sink/storage idea, and it combines galley drawers, a pull-out cutting board, a cutlery drawer and even a tongs storage compartment. There is a handy two-stage wired touch light that illuminates the area as you lift up the door. 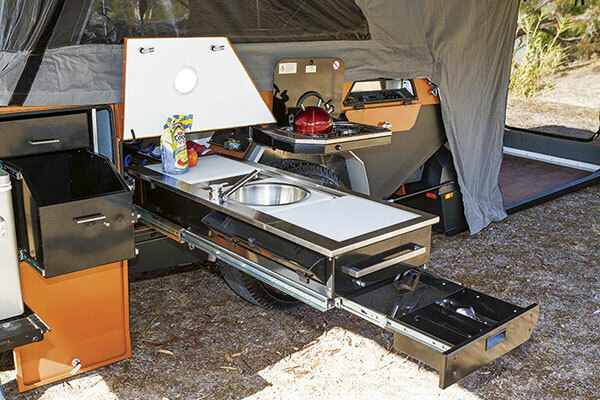 The two-burner Smev stove swings out to form a very workable L-shaped kitchen. I found the whole presentation innovative and built to a high standard. I’ve got a mate (Og, we call him) who packed up his dog and his surfboards into an EH Holden wagon in the early 80s and headed west in search of a better life. He found Utopia at a beach on Quobba Station in the Gascoyne, WA. Og lived in a cave for many years, surfing the big left-hand point break every possible moment and thriving on the region’s ample seafood delights. Oh my, how he would have loved the simplicity, comfort, strength and facilities of the Pioneer Gascoyne. I’m sure you will, too.